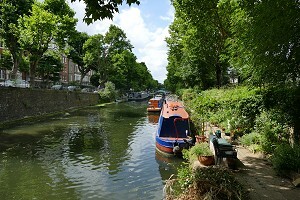 The Regents Canal with Maida Avenue visible on the left. 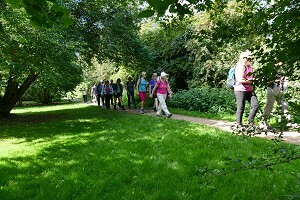 On Sunday 9th July, five of us met up at Paddington railway station for a seven-mile semi-urban walk in London. Leaving the station from the northern exit, we emerged by the Paddington Basin, which could be described as a canal cul-de-sac. 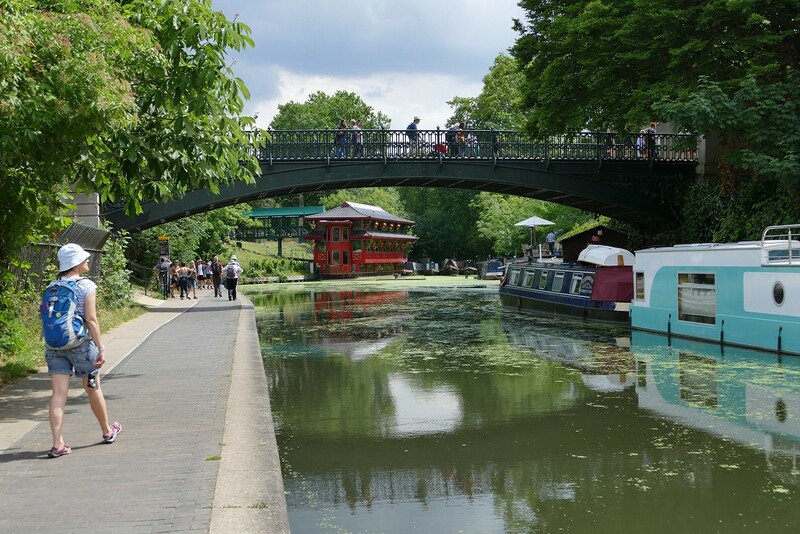 Following the tow-path westward, we soon reached Little Venice, a triangle of water at the junction of the basin, the Grand Union Canal and the Regents Canal. Here there were permanently moored barges containing cafés and a puppet theatre. 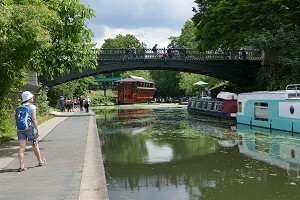 We took the Regents Canal branch, heading north-east. We followed the tow-path until we reached a locked gate, where we then had to follow the canal on the pavement of Bromfield Road. The Cumberland Basin, with its floating restaurant. 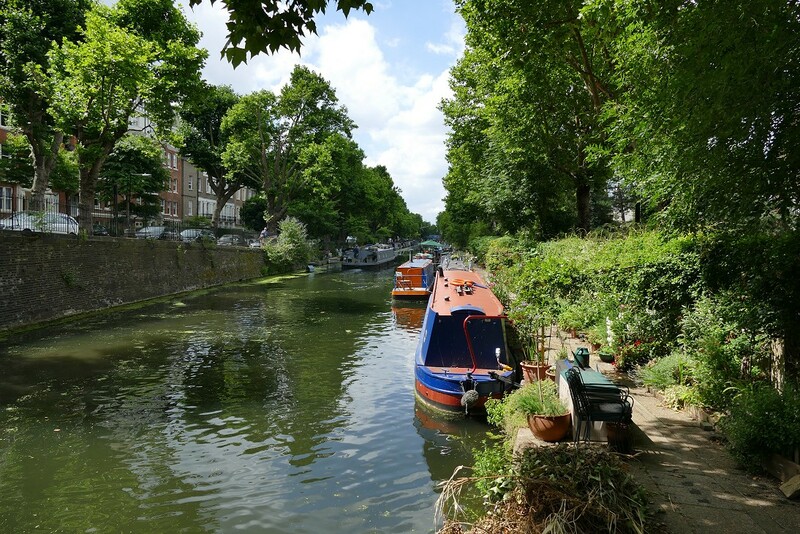 As the canal disappeared into the Maida Hill Tunnel, we took an urban route along (relatively) quiet roads before crossing (a rather busy) Lisson Avenue and rejoining the canal towpath. We were now somewhere between Lords cricket ground and Regents Park, although we could see either of them at this point. Following the canal in a large arc across the northern edge of Regents Park, we were able to some warthogs in London Zoo, on the other side of the canal. 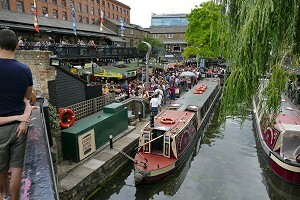 The food-court at Camden Lock. We reached the Cumberland Basin, where a floating Chinese restaurant was moored and the canal took a left turn. After a little longer on the towpath, we reached Camden Lock and its wonderful market. 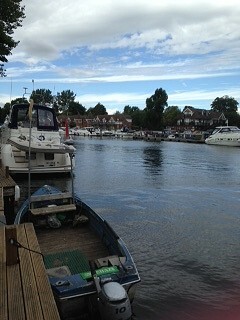 Stopping here for an hour, we fitted in lunch, a look around, and a quick drink at the Ice Wharf canal-side pub. Leaving the canal behind, it was roadside walking until we reached the edge of Hampstead Heath. We followed a well-trodden footpath up Parliament Hill, from where we could see plenty of recognisable London landmarks. View of London from Hampstead Heath. Descending to Hampstead Ponds, where there were bathers enjoying the warm weather, we exited the park, not too far from where we'd entered it. We then made our way to the Freemason's Arms pub for another drink, sitting outside in the warm sunshine. It was just a short walk to Hampstead Heath railway station, where we said our goodbyes and made our way home. See our route on Google Maps. Stopping for lunch in Bramshill Forest. This walk coincided with both the Wimbledon Finals and the British Grand Prix so unintentionally excluded tennis and motorsports enthusiasts! A small group of five ramblers uninterested in these events met at the car park opposite St Mary's Church in Eversley for the start of the walk. All had walked with BWW before - three regulars and two on their second walk with the group. We began along forest tracks through Heath Warren Wood and had a good view of a buzzard which flew over just before we crossed Bramshill Road. The next section of the walk was through Bramshill Forest. 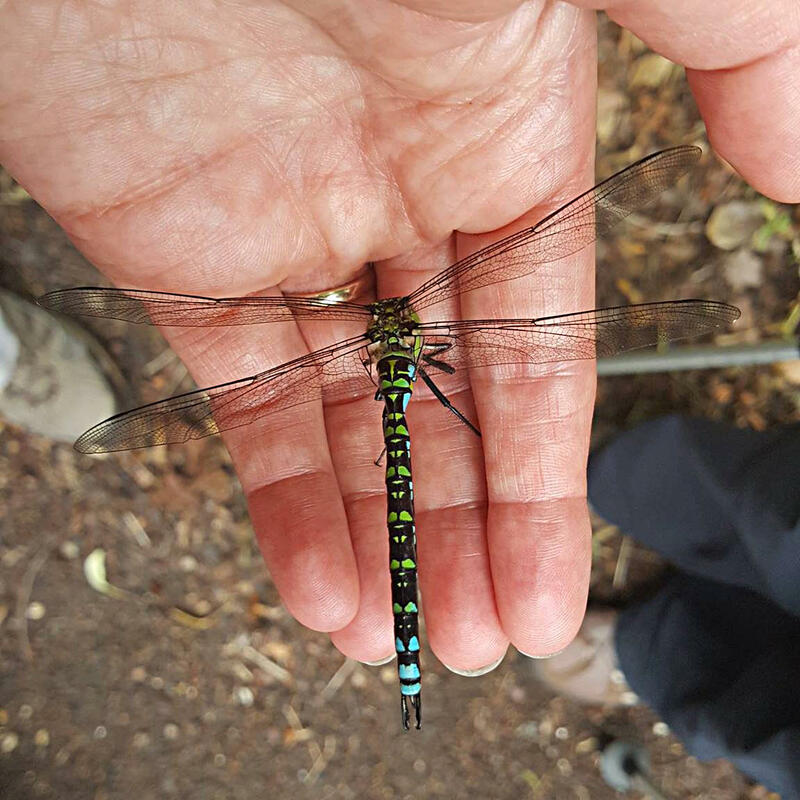 An injured damselfly (a Southern Hawker) found by the roadside. Here we passed three lakes where we saw several damselflies and dragonflies. We stopped for lunch by the third lake - an apparently peaceful setting until we discovered it was a popular place for dog walkers to play water based retrieval games with their pets. One particularly badly behaved (and also rather wet) dog even tried to steal lunch from one of our group! After lunch we left the forest and soon joined the Blackwater Valley Path, walking by the river where we saw damselflies, butterflies and red kites. We crossed back over the river at the footbridge next to the New Mill and the path continued through farmland to Eversley. The day had turned out to be quite humid so by now we were ready for another refreshment stop, this time at the White Hart in Eversley. Three of the group opted for cold drinks and the two who chose tea were impressed by the attractive chinaware it was served in. Passing through Yalden's farm, as we returned to Eversley. Following the break there was only another mile to the end of the walk. This last part of the walk included a good view of Warbrook House, an 18th century mansion now used as a conference and event venue. 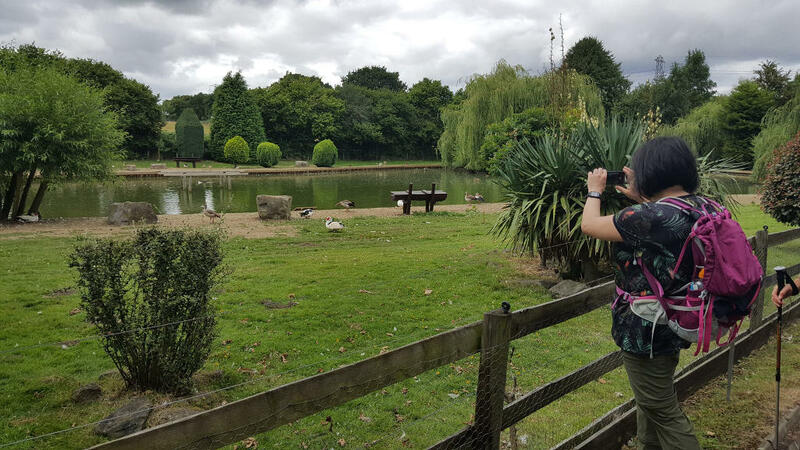 We also went past a farm with some goats and a lake with a large number of geese and ducks and two turtles. We wondered if these were real or stone ornaments until one ended the uncertainty by jumping into the water for a swim! Finally we returned to the car park past St Mary's Church. Thank you to Denise for leading this walk at short notice and for writing it up. On 23rd July, fourteen of us, including two newcomers, met at the park in Wooburn. The weather was fine but rain was forecast for 1pm so we set off in expectation of a soaking before the day was out. 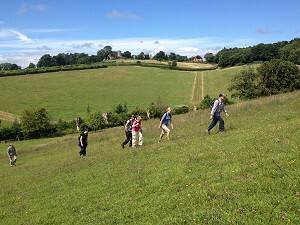 We encountered our steepest hill of the day almost immediately on the way to Flackwell Heath. After skirting the village, we paused to take in the great views over the Thames Valley before descending across open fields to Fern. We immediately had to climb back up the same hill we had just come down, only a little further along, to reach the different terrain of Bloom Wood. 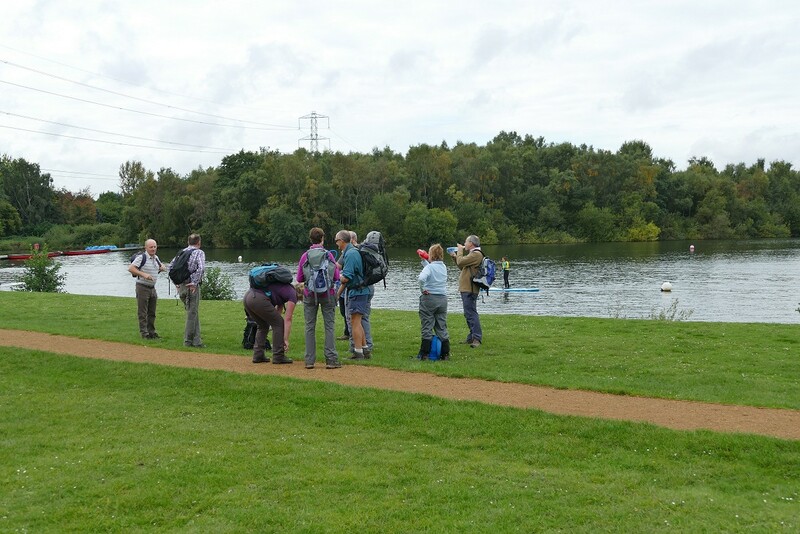 Then it was downhill again to Little Marlow and the Spade Oak nature reserve before arriving at the Thames for our lunch with activities on the river to entertain us as we rested. After lunch, we followed the Thames Path to Cookham, crossing over the river to pick up Shakespeare's Way through Hedsor Wharf. About half of us diverted up a steep grassy hill to visit the quaint Church of St Nicholas. Our efforts were rewarded when we found a 16-man barbershop quartet practising for a concert. They were a little surprised at receiving applause from a bunch of inquisitive ramblers. From Hedsor, it was a long walk up the final hill of the day to reach the Chequers Inn where we stopped for a well-earned drink before descending the half-mile back to our cars. See our route on Google Maps. As to the weather? We had a few spots of rain at one point but it remained fine for the rest and indeed by the end was really quite warm and sunny. Thank you to Sue and Colin for leading the walk and for writing it up. The sands on the south-eastern shore of Fleet Pond. 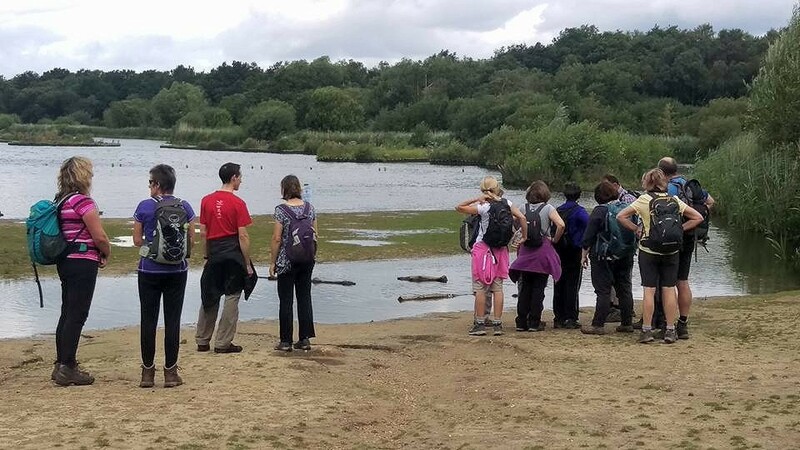 The weather forecast for Sunday 30th July was for partial cloud and possible showers, but there was bright sunshine when the sixteen of us set off from Fleet station and followed the footpath around the western edge of Fleet Pond. The clouds became more numerous once the walk got going and we followed the edge of the pond to its south-eastern where there is a sandy shore. (Not the 1960's singer.) 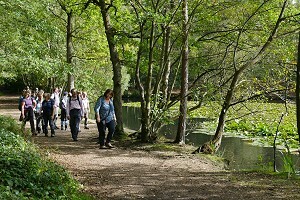 From there we headed south, following a stream that led from the pond to the Basingstoke Canal. Following the tow-path, back toward Fleet for about half a mile, we walked (ducked) under a very low bridge, then over another bridge and away from the canal into the Forest of Eversley. 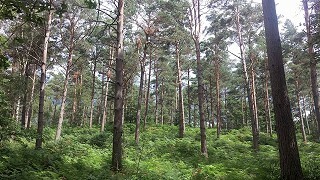 The Forest of Eversley, south of the Basingstoke Canal. On well-maintained paths, we made our way through the forest to The Foresters pub, stopping to have our picnic lunch just before reaching. A very fine rain began about half-way through lunch, which encouraged us to eat up quickly and head for the pub. Thankfully, the rain had stopped by the time we'd bought our drinks so we could sit outside in the pub garden. 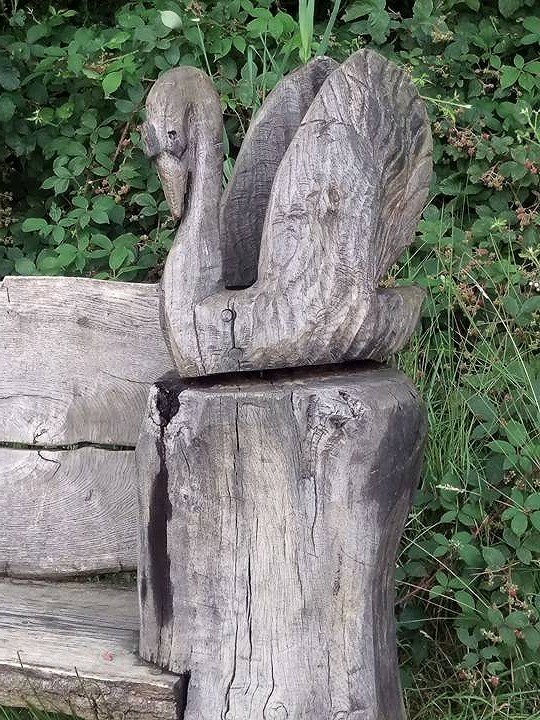 Carved swan in Fleet Pond Nature Reserve. Suitably refreshed, we left the pub and followed a path up to Pyestock Hill, where we crossed a large roundabout on the A323 before crossing the Basingstoke Canal. 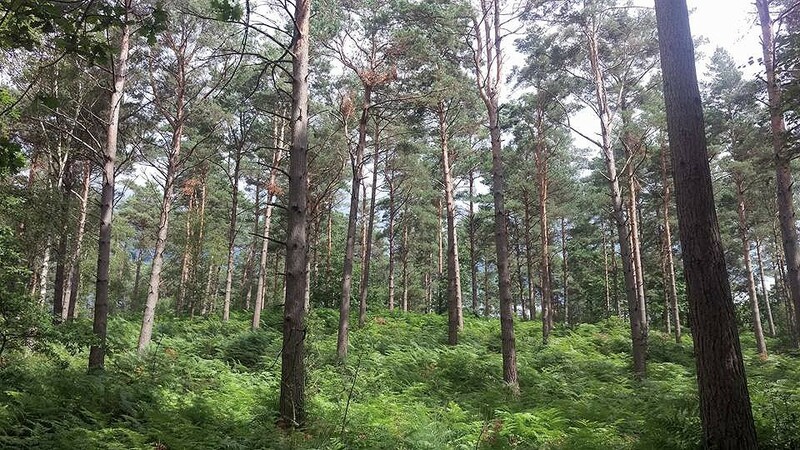 Heading back into woodland, we made our way north and then north-east, toward Southwood, before turning west and heading through heathland on our way back to the pond. 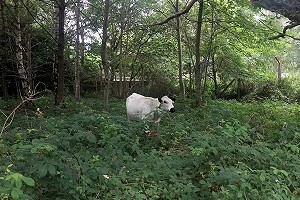 A solitary white cow observed us as we approached Fleet Pond. 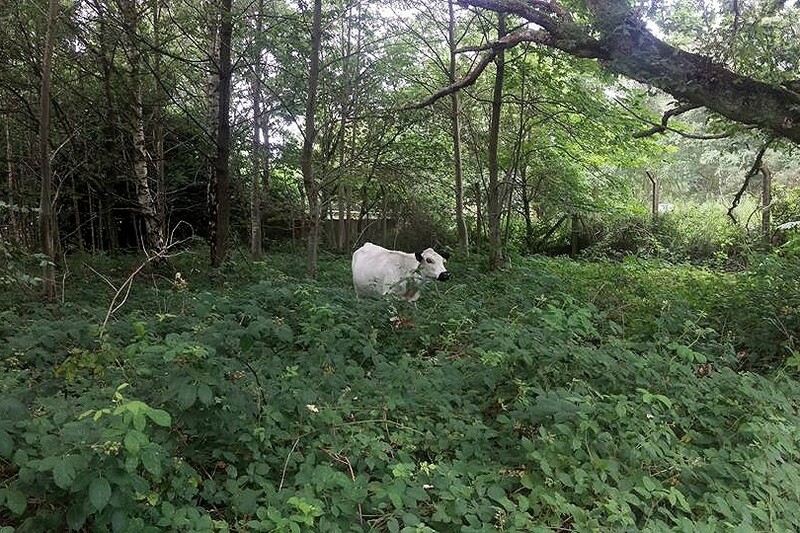 As the heathland turned to woodland, we were slightly surprised to find ourselves being watched by a solitary white cow, lurking in the undergrowth. As we re-entered Fleet Pond Nature Reserve, we saw some interesting wood carvings. These were mostly insects and birds on top of posts, but we also saw a beautiful swan on the arm of a bench. A short walk along the northern shore of the pond and we were back at the railway station. See our route on Bing Maps. Thank you to Liz for providing the photos. 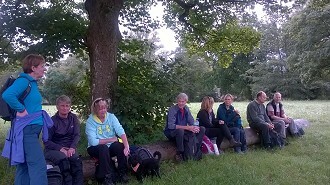 On Wednesday evening 3rd August, twelve people met up for the last (for the time being) of our evening walks. 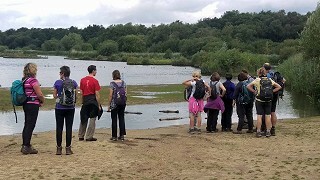 The leaders were amazed by the good turn-out (which included a newcomer to the group and visitors from another group) considering the weather forecast was for heavy showers. 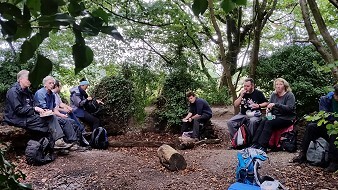 However the evening remained dry for the duration of the walk and many of the group stayed on for a drink at the pub afterwards. 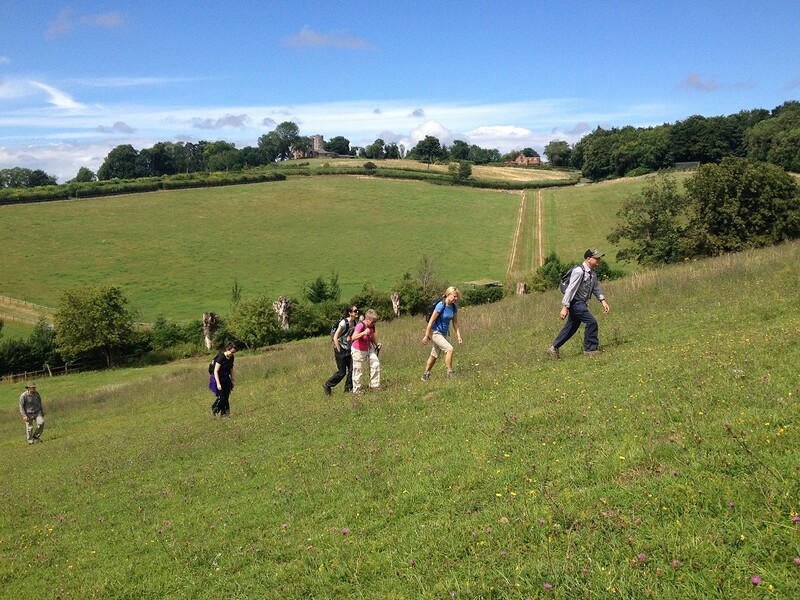 Walking out from Holyport towards Fifield. This year the August bank holiday weekend was blessed with warm, dry weather. Yes, I know! Anyway, eighteen of us (including a few newcomers) congregated by the war memorial in Holyport for a 5½ or 10-mile figure-of-eight walk. 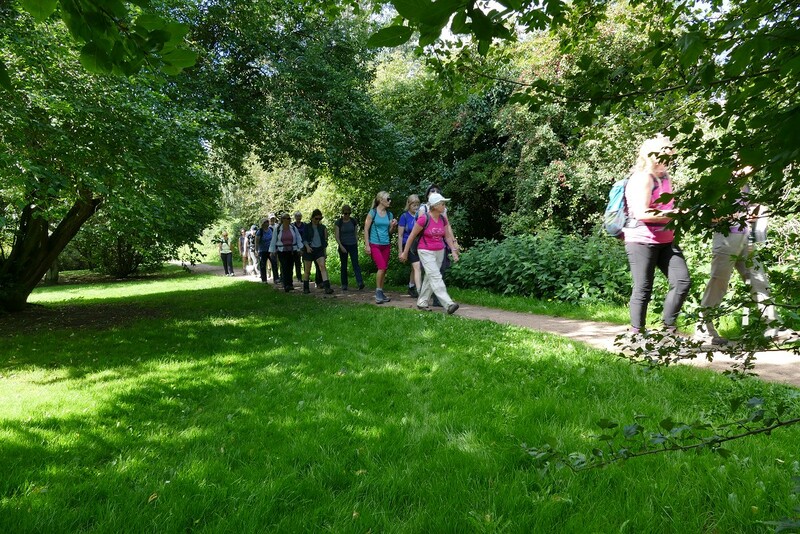 This offers a choice of a short or long walk, which is useful to people trying out organised walking for the first time and may not know what sort of distance they can manage. We walked along the quiet Holyport Street before crossing a field and joining Stroud Farm Road. Leaving this road, we followed a long straight path with open fields to the right of us and domestic gardens to the left, then heading across the fields to Fifield. Crossing a bridge near Fifield. The next bit of the route went through a field of horses. Some were in roped-off sections but two were in the main field and standing by the gate we needed to go through. A brief safety announcement was made, reminding people not to walk immediately behind horses, unless they want a kick. 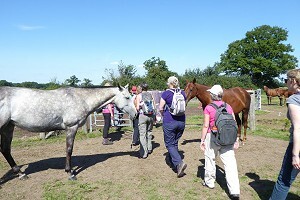 We hoped that the horses would move away as we approached the gate. Two horses guarding the gate like bouncers at a nightclub. They didn't. In fact, they stood either side of the gate, inspecting us as we passed through, like a couple of bouncers outside a nightclub! Further on, we passed through a field of young bullocks. At first, they remained in the far corner as we walked through, but then things got a bit tricky. They moved at some speed toward the corner of the field where we were leaving. Most of us were over the style before they arrived, but a few weren't. A careful detour around the herd followed by a wait for them to move away was required. Naturally, this was a stressful time for some of us, but we all made it through without incident - into the next field, where there were more young bullocks! Having our picnic lunch on the green at Holyport. Back at Holyport, we said goodbye to those just doing the morning walk and said hello to Greg who was joining us for the afternoon walk. 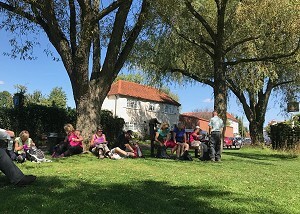 We had a picnic lunch stop by the village pond followed by a quick drink at the pub before the remaining twelve of us got on with the second part of the walk. This took us through fields and woodland, emerging on to Sturt Green road slightly further down road than originally planned, which caused a brief moment of confusion. We soon found the correct route and carried on past Leslions Farm and Little Foxley, before returning along tree-lined paths back to Holyport. See our route on Google Maps. The incident with the bullocks has made us think that we need to update our guidance to walk-leaders, so that we know what's best to do if and when this happens again. Nine of us met up on Sunday 10th September in Oakley (between Overton and Basingstoke) for a repeat of a walk that I'd led before in September 2013. 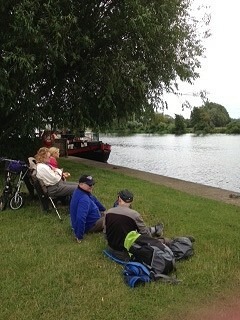 We had three newcomers trying out our group and a couple of visitors from neighbouring groups. This old walk was a new one to most of the people here today. 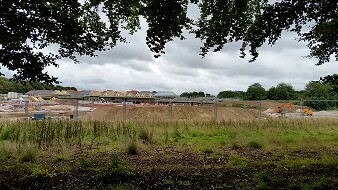 New houses being built near Kempshot. We set off along Station Road and passed St Leonard's Church before crossing Oakley Park. 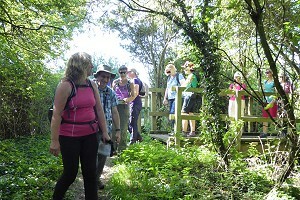 This led us to the Wayfarer's Walk, which we followed through Itchen Row, Bull's Bushes Copse and Bull's Bushes Farm. We didn't see any bulls (or any other farm animals) on this walk. We left the Wayfarer's Walk at Southwood Farm and began to follow the course of a Roman Road up to Kempshott. As we passed through a wooded section of this path, through the trees we were able to see some new houses being built in what was just a field when I last led this walk. Lunch-stop on the Roman Road near Kempshot. Finding some fallen trees to use as benches, we stopped for our picnic lunch in the shelter of the woods. (It wasn't raining but the wind was picking up.) After lunch, we continued along the course of a Roman Road, turning off as it passed an existing housing estate in Kempshott. Heading west and then north across fields, we reached the village of Oakley. Here we had to make a choice... The weather forecast had predicted heavy rain for the afternoon. We could either head straight back to the car park before it started, or go through Oakley and stop at the pub. Cottages and a pond in the village of Oakley. We examined the sky and decided there was enough time to visit the pub - a quaint old place called The Barley Mow. Suitably refreshed, we left the pub to be met by the faintest hint of a drizzle, which soon stopped as we completed the last part of the walk. See our route on Google Maps. Nine hardy souls plus one well-behaved dog called Cookie met at Watlington car park on an overcast Sunday morning for a 14-mile trek to Ewelme and back. Our group included two newcomers. Coffee stop at Cookley Green. We started with a pleasant short stretch through town then headed uphill through fields and woods to the highest point of our day at Cookley Green. A convenient nine-person tree-trunk provided seating for our coffee stop here. It was then downhill all the way, through a variety of landscapes, following The Ridgeway for part of the journey. Highlight of this segment was a forlorn sheep stuck in a water trough. No matter how hard it tried, it could not free itself. Up stepped valiant Keith who had clearly watched too much Countryfile judging by the skilful way he hauled it free. Our hero of the day. After dodging some cows which were grazing appropriately enough on Cow Common, we soon reached Ewelme with its delightful pond and street-side stream. The watercress nature reserve with its benches and tables became our lunch-stop before a unanimous vote saw us head to the nearby Shepherds Rest for a quick beer. Refreshed, it was off again to see the second part of the watercress beds before visiting the charming almshouses at the other end of the village as well as Jerome K Jerome's gravestone. 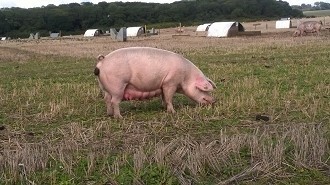 We walked alongside a large pig farm admiring some well-fed specimens before scaling Swyncombe Down to pick up The Ridgeway again. This led us the rest of the way back to our start point. See our route on Google Maps. Many thanks to Colin for leading this walk and for writing it up. 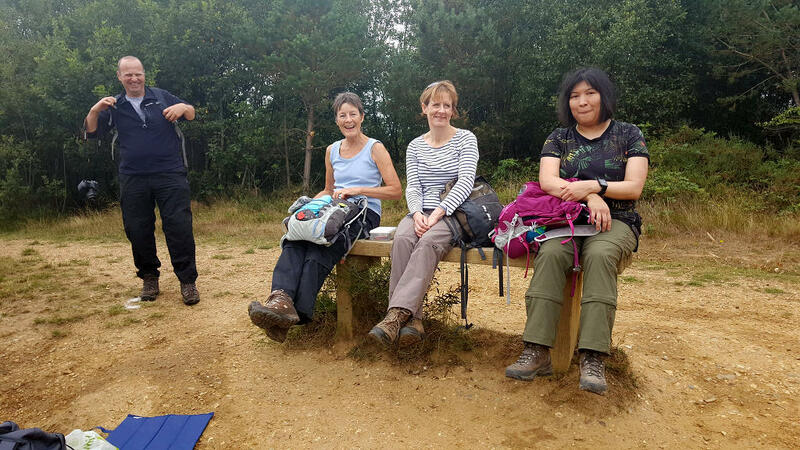 On Sunday 23rd September, fifteen of us (including several visitors from other groups) met up for an eight-mile walk from Crowthorne. The walk was a modified version of one that Sue has led for us before. Stopping for a quick break by Horseshoe Lake. Starting from outside the Post Office by Crowthorne station, we set off along a woodland footpath that ran parallel to the railway line. As we approached Edgbarrow Woods, we crossed the railway line into Ambarrow wood. 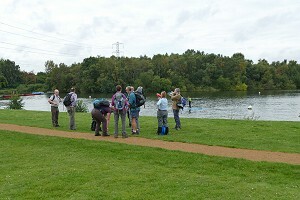 As we passed through the car park there, we came across a small group of older walkers. A comedian amongst them was trying to convince us that they were lost. He even asked if we had any food! Passing through a field of horses, we stopped by Horseshoe Lake, where we could see various water-based activities going on, including paddle-boarding. 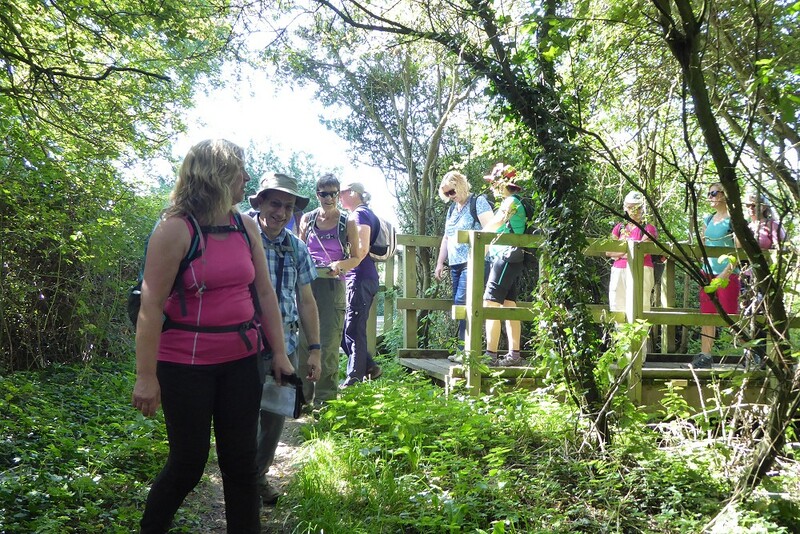 We then followed the Blackwater Valley Path through Moor Green Lakes Nature Reserve. At one time a gravel works, this area is now being restored to a place of natural beauty, popular with bird-watchers. We left the Blackwater Valley Path and headed through Finchampstead to the green by St. James' Church, where we stopped to eat our packed lunches before popping into The Queen's Oak pub for a drink. Suitably refreshed, we crossed several fields to Wick Hill where we joined a wooded track called Heath Ride. The very straight path headed back to Crowthorne, but we stopped along the way to circumnavigate the picturesque Heath Pond. At the end of Heath Ride, there was a short section of road walking before we were back where we'd started. You can see our route on Google Maps. 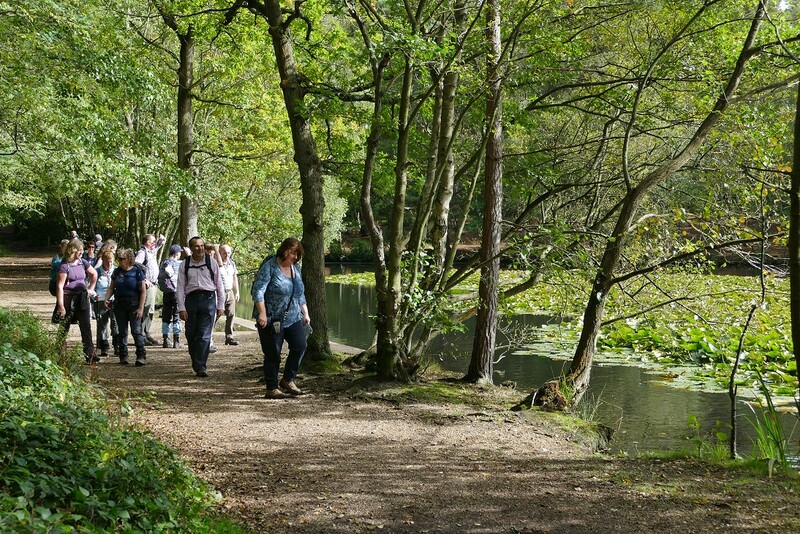 We're always looking for new walk leaders, as are most other walking groups, and quite often we have members who would like to lead a walk but doubt their own navigational skills. 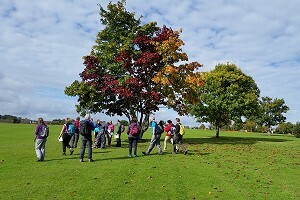 Lee, from the Berkshire Walkers 20s & 30s, led a special map-reading walk for his group and ours on the last Saturday in September. Navigating through a playing field at Cookham Rise. Lovely autumn colours on the tree! Starting from outside Cookham railway station, we were instructed to count our paces while walking between two fixed points to help us with estimating short distances. Arriving at a nearby playing field, Lee gave some instruction on understanding various map symbols and on working out bearings and distances to points on the map. As the walk progressed, Lee would nominate someone from the group to lead a small section of the walk before stopping and explaining some new features of map-reading. Then it would be someone else's turn to navigate the next section. Even though I'm an experienced walk leader, I still felt a slight pang of nerves when Lee pointed at me and said 'You lead the next section.'. Stopping for a drink at the Jolly Farmer. 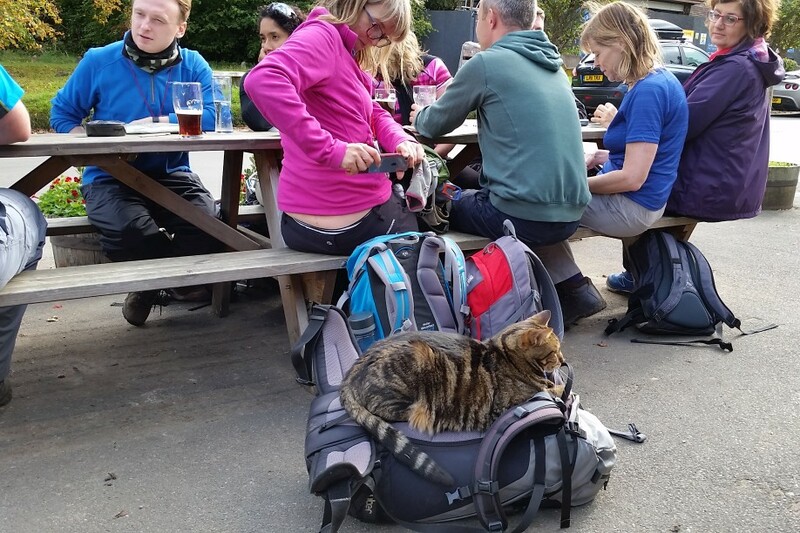 The cat looks very relaxed on Lee's rucksack! The beautiful blue sky gradually clouded over and a fine drizzle began around lunchtime, so we stopped off to eat our packed lunches in the woods. The drizzle stopped as we continued the walk, arriving at Cookham Rise, where we made a welcome stop at the Jolly Farmer for a drink. 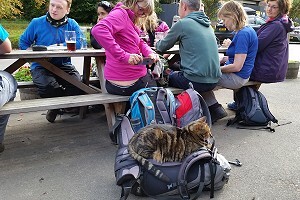 We sat outside and were joined by the pub cat, who chose to lie down on Lee's overturned rucksack! The last part of our walk took in Winter Hill and its golf course. En route, Lee was getting us to spot visible landmarks and locate them on the map, and also got us to estimate the gradient of the path through the golf course. By the time we'd got back to the railway station, most of us had led part of the walk. See our route on Google Maps. Thanks Lee, for an enjoyable and educational walk.